Home / Blog / What Do Mesenchymal Stem Cells Look Like? What Do Mesenchymal Stem Cells Look Like? 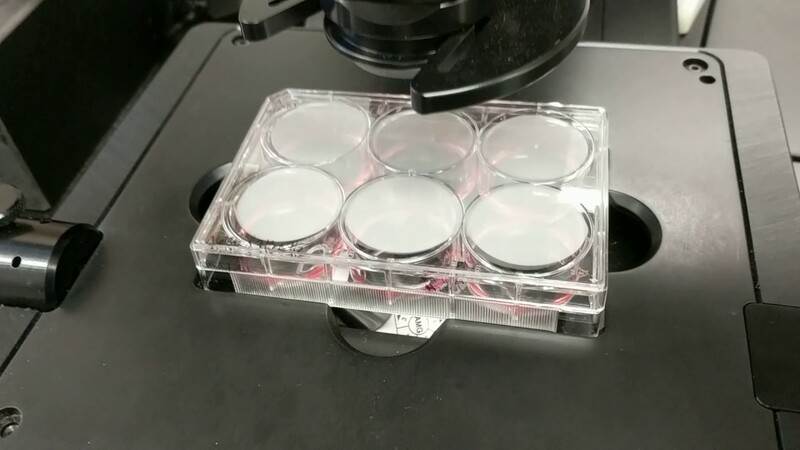 We recently invited you into our research lab to learn about colony-forming units (CFUs) and how we use these to roughly quantify mesenchymal stem cells (MSCs) in a sample. Today we’re going to zoom in much closer on a segment of this process and show you MSCs from the incubation point to how they look in culture on inversion microscopy. So step back into our research lab again (watch the brief video above) and take a peek at mesenchymal stem cells in culture. Before I explain what you’ll see, let’s briefly review how we begin the culturing technique from our “What Is a CFU?” post. We first seed the culture plates with highly diluted bone marrow concentrate (BMC), which contains the mesenchymal stem cells. We place these in an incubator and culture, or grow them for ten days. As the video above begins, we have some MSCs in culture in the incubator. There are actually a couple vessels in which we can culture cells, and you will see two in our incubator. One is monolayer flask, and the other is a culture plate containing six culture areas called “wells.” So after I pull the plated cells out of the incubator, Dustin, one of our research scientists, puts them under the microscope so we can get a good look at them on the microscope screen using inversion microscopy. The device Dustin is using here is different from the kind of microscope you used in high school (compound microscope). The traditional scope you’re used to generally needs to stain cells to show anything, a process that can’t be used to observe living cells as the stain might harm or kill the cells. An inverted scope excels at observing cells in culture without staining. In fact, the inverted scope he’s using here is also fitted with a fluorescence function and software so that you can see the parts of a cell and measure changes. For example, we used it in our study of how local anesthetics impact stem cells and measured the calcium stores in the endoplasmic reticulum. What is Dustin looking at under the scope? The Mesenchymal stem cells (MSCs) actually adhere to the bottom of the plastic wells, where they grow in culture. Under the microscope and imaged on the screen, you can clearly see what these growing MSCs look like. The simple description is that the MSCs are shaped like a spindle from an old-fashioned spinning wheel. So you’ll see the fatter segment where the nucleus is located and then a tapering off, like the shaft of the spindle, to one side or the other. The scientific description, Dustin explains, is that MSCs are fibroblastic in morphology, essentially appearing elongated and linear. In the United States, all of the procedures that use your stem cells require isolation of the stem cell fraction from a tissue, such as the bone marrow, in the same surgical procedure. These procedures usually occur on the same day as the harvest of the stem cells. Obviously this isn’t possible with culturing mesenchymal stem cells as it is a much longer process during which we incubate the cells for 12-21 days, and because the FDA classifies cultured cells as a drug, it is currently illegal to use them here for therapeutic purposes in the U.S. So here, we’re limited to using cultured MSCs for experimental and research purposes only. Outside of the U.S., such as at our licensed Grand Cayman site, we can use cultured MSCs for therapeutic purposes and have done so for many years. The upshot? I’m a visual learner, so for me, to see first hand, what’s being written about, expands my knowledge. So I hope this peek at MSCs gives you a better understanding of them. Be sure to watch the video above as well as our CFU video to fully enhance your understanding of MSC terminology. This lab series is awesome, keep it up!